Kinnaur is situated at the Indo Tibetan Boarder in the valley of Knagra. This place is 200 Km away from Simla; the capital city of Himachal Pradesh. Travel to Kinnaur & Kangra is very enjoyable experiences as it bring you close to the typical Buddhist culture of India and Tibet. Kinnaur & Kangra is abundant with numerous tourist attractions worth visiting. Bhaba Valley, Satluj River, Gompa's etc. are some of the famous attraction of Kinnaur & Kangra. In addition to this, we are specialized in arranging Travel to Kinnaur & Kangra. Recong peo is the district headquarters of Kunnaur. Recently His Holiness the Dalai Lama has built Gompa called â��Kalchakraâ�� in a ceremony in 1992. Hu-Bu-Lan-Kar gompa is also situated here which is said to be founded by Rinchensang-po in 950-1055 A.D.
Kalpa is 14-kms from Powari on the link road. Across the river in back drop of Kalpa is the Kinner Kailash range. It is a beautiful picnic spot in the region. This valley is 57-kms away from Kalpa. This place is named after a beautiful village Sangla. Sangla is located on the bank of Baspa River. 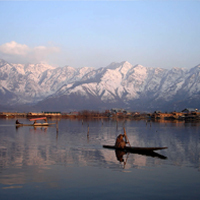 The panoramic snow clad beauty of the place is very famous. Chitkul is the highest village in the Baspa valley. It is situated on the right edge of Baspa River. The 3 temples of local goddess Mathi, are the main attraction which were constructed about 500 years ago. The village is located between Taranda & Wangtu on the bank of Satluj. Ghoral, Antelopes, Black & Red Bears can be spotted sometimes in the higher ranges of this palce.